... in May of 1998, we took the plunge and Rainyside.com was born. Co-founder Travis Saling reflects on the history of RSG. Debbie Teashon talks about the site's mission. One of our former headers. PACIFIC NORTHWEST — Back sometime during the winter of 1996-1997, Debbie Teashon and I were chatting online. We'd known each other for several years, thanks to our mutual interest in gardening. I remember that night she seemed pretty excited. Deb told me about her new responsibility as a gardening editor for an international online web site. At some point she also mentioned they needed an editor that could cover vegetable gardening, so I signed up as well. For about a year we both wrote biweekly articles for the site while also attempting to answer the many gardening questions our readers would post from around the world. Over time, though, I began to realize that I wasn't the best person to advise someone attempting to grow lettuce in hot New Mexico or watermelon in Australia — the climates were too different from my own, and I've never gardened anywhere but here! My all-too-frequent response to questions became "Some of my information does carry over to your situation, but you're better off getting advice from someone with local growing experience. Additionally, I felt too often I was forced into writing bland generic gardening information in an attempt to cover all possible situations. As Debbie and I continued to chat frequently, it became obvious she was feeling the same way. For a few months we batted around the idea of collaborating on a website focused on the maritime Pacific Northwest. By working together, combining her expert knowledge of ornamental gardening with my vegetable gardening experience, we hoped we could provide local gardeners with information and help for their gardens. Finally, in May of 1998, we took the plunge — Rainyside.com was born. It soon became apparent that people had been looking for what we provided. Our readership grew quickly, as did the number of email questions we received! While there have always been a few local garden writers, along with a handful of companies dedicated to providing resources for our region, too often the only information readily available to the gardeners around here was in syndicated national garden columns. But our winters are different from Washington, D.C.; plants often die from water-induced rots and disease around here, not from their roots freezing solid. If you live in Portland, but follow a Georgia gardener's sage advice about tomato culture, you're going to be disappointed eight times out of ten! Northwest gardeners learned that the hard way, therefore, when Rainyside came along, people soaked it all up and asked for more. Later, when we initially opened up the forum after a year or two, our expectations were rather modest. We hoped mainly to provide better support to beginning gardeners by helping them come together with other, more experienced, local growers. (In large part we hoped to take a breather from answering so many email questions on our own!) I think it's safe to say the forum grew significantly beyond our expectations. Certainly it did help people find answers and advice, per our original goal, but the forum also became a thriving community of friends. Debbie and I worked together on Rainyside for about five years, until 2003. As often happens with friends that work closely together, our visions eventually diverged. I split off and started Westsidegardener.com, where I could mainly focus on writing about the edible garden. Happily, Rainyside has continued to flourish and grow under Debbie's guidance. It's hard to believe this all began ten years ago! I can't speak for Debbie, but I certainly didn't foresee the level of success Rainyside would achieve. Happy anniversary, Rainyside! May the next decade be even better! May 1998 marks the year "Rainy Side Gardeners" began online; therefore, this month we celebrate our 10-year anniversary! It's hard to believe that ten years have passed since Travis Saling and I wrote our first articles and placed them online. We vowed that we would be a web site dedicated to bringing Northwest gardeners regional information and lots of content. Rainy Side Gardeners continues with this commitment, with quality articles by garden writers from around the region, plus frequently adding to the Growing Guide and featuring news for the gardening community. In addition, we maintain a calendar that helps non-profit organizations get the word out about their fundraisers. Besides non-profits, we keep on promoting those in the garden business community who offer classes and workshops at their nurseries, and many other exciting and fun venues. All this information continues to be free of charge to anyone that comes to the site. "Rainy Side Gardeners" would not be what it is today without you. We believe our Northwest gardening community is made up of great gardeners as well as aspiring ones, all with a passion for gardening. With a climate that grows fantastic plants and gardeners who keep alive the Northwest community attitude of friendliness and giving, we strive to reflect that spirit on the web. 10 years of pioneering...wow. Congratulations. I didn't want the occasion to pass without congratulating you on your 10 year milestone. You should be proud of the trailblazing work you have done in bringing high quality horticultural content to the web. Well done, you are truly a pioneer! I can remember finding Rainyside sometime back in 2003 (has it been that long?) after doing a Google search on one of our PNW native plants. I can't remember now what I was looking for but sure enough, up popped up a link to one of Debbie's well research plant bios with gorgeous photos. Then I started avidly reading many other plant bios and I was hooked. Great information, great pictures, what more could I ask for? Well, on top of all that, there was a forum of a great bunch of people talking about PNW plants. Very friendly and welcoming. So I created a member login and started participating. What a lot of fun and quite addictive! Even now, I love to get on Rainyside with a great cup of coffee and see what people are talking about. I found that I really loved sharing what I knew about plants along with picking up great tips on gardening from all my Rainyside pals. I really enjoy getting together with other Rainysiders and making field trips to nurseries with like-minded folk. What a great resource and community and I am glad to be apart of it. Thanks Rainyside! My how time flies! Seems like just yesterday I stumbled into Rainy Side Gardeners and discovered great regional gardening information and friendly people. Eight and a half years later, it is still one of my favorite gardening websites. Congratulations and best wishes for many more years of success! As I wandered the world wide web, searching for sustenance for my gardening addiction, I found The Rainyside Gardeners. As most gardening web sites seem to lean heavily towards the gardens east of the Rocky Mountains, finding a Pacific North Wet specific website was like the first chocolate rabbit my gramma hid for me: which ear should I eat first and how long can I make it last? It's soon to be four years and the bunny still has legs and a round belly. For the scientific and rational part of me the articles and resources continue to assist me in my horticultural activities, while my social and playful parts revel in the comradery of the forums. I hope to keep wading through the RainySide for decades to come. Why I Love Working for Rainyside.com! Just after I moved to North Kitsap County (Kingston) in 2004, I met Deb Teachout. It so happened that were attending the same writing group. We were strolling to our cars after my first meeting, chatting about writing and about walking. She invited me to join her, both by editing the material for her web page and getting a morning stroll. And so began our collaboration in exercising our minds and our legs! I've been editing the informative and fun articles that she writes for almost four years. Sadly, I have moved out of her neighborhood and do not enjoy that beautiful woodsy walk just now, but I plan to keep on editing for as long as the need is there. Deb's an excellent client, always accepting my edits with good humor and no questions! She gets an A+ from me! Lots of things change in 10 years. It seems I have more plants and less hair every year! Sometimes things change, but one thing that hasn't changed is the great information and helpful tips that I have always found on the Rainy Side Gardeners website. It is so great to have a local site packed with information just for Northwest gardeners. 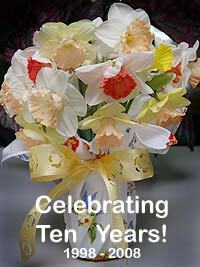 Congratulations Debbie and Rainy Side Gardeners on 10 wonderful years! the authoritative, picture-perfect, on-line gardening guide. the pinnacle of sage advice for planning pots and plots. and if the prose is flowery, that's as garden prose should be. Let's tip our hat to Debbie, the doyenne of the site. She photographs and edits, and still finds time to write. Peruse the newsletter for opinions insightful. about a Top Ten List that's episodic. So all hail this gardening destination! forget the bubbly, where's the cake? !